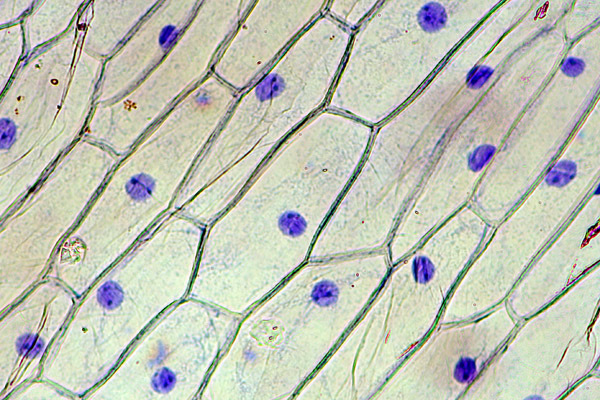 This is a simple preparatory technique that allows students to observe the otherwise difficult to see nucleus of onion cells. There is no need to employ, possibly harmful, DNA staining chemicals. 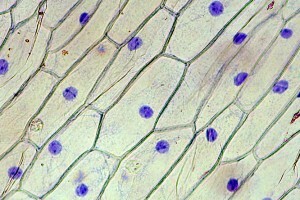 The nuclei of onion cells stain blue. Onion, tap water, alcohol, fountain pen ink, several small beakers or film containers. Using a sharp knife, cut out about 1 cm² of onion material. This may be done by the teacher to reduce the risk of injury. The individual layers of the onion are separated by a thin skin. Peel this skin off using your fingernails or tweezers. The skin can be found on the inside part of each layer. Place the skin into pure alcohol for about 30 seconds. This procedure removes water from the cells. Place the skin into the ink. The ink, which is water-based, will enter the cells and strain the onion skin deep blue. Using tweezers, transfer the skin into pure water and rinse it for about 30 seconds or until no more ink is given off. The skin will still have retained its blue color. We now start the washing steps. We have to remove excess ink from the cells. Transfer the skin into pure alcohol for about 30 seconds. Some of the ink will be removed staining the alcohol slightly blue. The skin is transferred into pure water for about 30 seconds. If the cytoplasm of the cells is still too dark, then it is necessary to repeat the washing steps 6 and 7 for a second time. Problem: The cells are too blue and too dark. Solution: The cells were insufficiently washed. Prolong the washing times or introduce another washing cycle. Problem: The nuclei are not stained, or not stained enough. Solution: There could be several reasons for this. The onion was not placed into the alcohol. Therefore the water inside the cell was not removed and the ink could not enter the cell. The onion was washed too intensively. This is the most probable cause. If the onion was washed twice, then the washing step should be conducted only once. It could also be that the washing times were too long. If the nuclei are stained lightly blue, then this indicates that the staining procedure is in principle working, but that too much of the ink was removed. Thank you for the description of how to stain onion cell nuclei. I am a Science teacher in a poorly equipped school in Thailand. We don’t have the standard materials for staining cells and this ink method worked perfectly. Now my students really believe there are nuclei in onion cells – and cell walls! Hi, very thanks for the good descriptions. I have a question. Do the yeast cells count is such as blood cells count? I will appreciate your answer. >Do the yeast cells count is such as blood cells count? Yes, there is no difference in counting procedure. Yes, there is no difference in counting procedure (using hemocytometer). What is the name of the stain used? Regular fountain pen ink (water-based).